Frederica von Stade: Live in Edinburgh 1976. A treasure, recorded with pianist Martin Isepp, in a great program of Dorumsgaard, Mahler, Ives, Poulenc, Britten and Offenbach. Dawn Upshaw: The Girl with Orange Lips. Worth it just for Earl Kim's Where Grief Slumbers alone, but there's more: outstanding sets by Ravel, Stravinsky, Falla and Delage. Karita Mattila: Arias & Scenes. Bought it for the scene from Janacek's Jenufa, but was equally wowed by her Wagner, Puccini, Richard Strauss and Tchaikovsky. Gerald Finley: A Song for Anything. Roughly a third of Charles Ives' 114 songs, well-chosen and extremely well-characterized by Finley and his marvelous pianist, Stuart Drake. Jessye Norman: Richard Strauss Lieder. One of the first CDs I ever bought, and still a favorite, with the debut recording (I believe) of "Malven," the little Strauss gem that was unearthed in the mid-1980s. Geoffrey Parsons is miraculous at the piano. I am surprised there have been so very few responses to Bruce's topic. I have masses of solo discs, but to count as a recital disc, I was thinking that it ought to have been a planned recital as against a ragbag compilation. Over the years a lot of singers have recorded the bulk of specific recitals that they have been touring with that year. However, the first one I want to mention is by a relative newcomer, she has recorded a recital disc for EMI in their Debut series. Subsequent to this issue, she has recorded Marzelline in the new Colin Davis Fidelio and the soprano part in Rattle's Carmina Burana. The singer is Sally Matthews. Although she is in fact quite an experienced singer, this is her first recital. She has a clear, clean, sweet soprano voice. It is a Pamina voice and this is one part she has sung. There is vibrato when needed and she floats the high notes really beautifully. Her singing is poised. The disc comprises of a group of Schubert, a few Strauss, some Poulenc and one song by someone called Bachelet, who the booklet is silent about beyond telling us he is principally famous for writing opera!?? 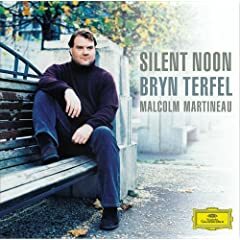 The disc opens with a very atmospheric version of Nacht und Traume, she is good at the seeming stillness at the centre of the song and the pianist is the sure footed Malcolm Martineau. He can usually be relied upon to prevent singers from any self indulgence. That group includes a beautiful timeless version of what was almost the last song Schubert wrote, The Shepherd on the Rock. The rippling Clarenet player is Thomas Watmough and altogether this track reminded me of the early recording made by Margaret Price. Litani is also included, again, she captures the stasis of that prayerful song. The Strauss includes the lively and the gentle, almost inevitably, Morgan gets a run out, but so well done, it is sheer pleasure. There is also an extatic version of Cacilie with the pianist producing an orchestra of sound. Turning to the Poulenc, she sings eight songs, they seem to be over in a flash, tangy and in what sounds to me like very good French. Finally a five and a half minute song, Chere nuit by Bachelet. What a nice surprise, substantial in every way, late 19th century French with lovely arching melody and reminiscent of Faure. I know what you mean. Girl with orange lips, eh? This sounds great. Nice program, and an excellent accompanist, too, in Malcolm Martineau. I'm always eager to discover great new singers, so thanks for posting this! I was meaning to contribute here all along but my Opera and Vocal collection is quite meagre really, I don't think I have more than 20-25 recital discs in all. And I love almost every single one so it would be very difficult to single anything out. I recently missed a severely underpriced copy of her 10 disc Decca set. I have several of the Debut recitals. I thoroughly recommend the following two. 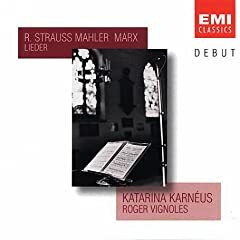 Firstly, Katerina Karneus accompanied by Roger Vignoles. Karneus won Cardiff Singer of the World in 1995, It is a mystery to me as to why she is not a high profile star. I have seen her as Octavian and she was superb. An excellent actress, she has a great touch with comedy. This is a rich voice, but it can scale the heights with an almost soprano tone. Lots of light and darkness. She characterises songs telling a story vividly. The voice is well schooled and she did record an excellent Nuits d'ete that was attached to the BBC Music Mag, but otherwise it is unavailable. In this recital she has, as do others, mixed standard repertoire with some esoteric material. Richard Strauss, Mahler and Joseph Marx. 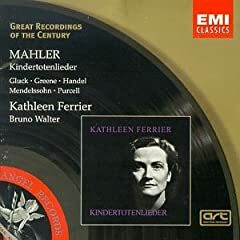 I will not give a blow by blow description, but especially like the Mahler, various Knaben Wunderhorn songs, not all from the common collection, indeed some rarely recorded songs that make a nice change and a contained grave and beautiful reading of the Ruckert Lieder. Vignoles is a real partner and he especially provides an ebe and flow. The Marx songs are very much in the late romantic German tradition with a twist in the harmonic language. Karneus delivers them with real feeling and detail. He insists on a wide range in the songs and as indicated, this singer has no trouble with the huge leaps and throws the ribons of melody into the air, to let them hang there. Another Debut disc, this time from a singer who may well be familiar. 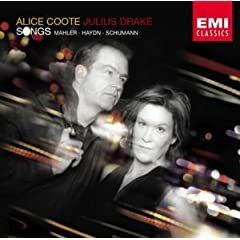 Alice Coote. She was singing Sesto at the Met last week. But I have several times read that she has cancelled concerts at short notice. Usually a real risky thing for an up and coming sinder, but, there she is at the Met. This is a darker voice, grainy, vibrant, a highly individual timbre. An intelligent singer. Her recital is a fairly extraordinary collection of pieces that in the UK are pretty much regarded as Janet Baker territory, She throws down the gauntlet. At no point did she remind me of Baker, she is working them through for herself. The general tone of the recital is quite grave, Julius Drake is a real poet of an accompanist. He creates moonlit landscapes and matches Coote's range of volume. My own feeling is that she does not communicate quite as directly as Baker, but she is very much worth listening to. In Ulricht she is not as hieratic as I like. But in general her Mahler very much suits her. The Haydn is arched well across the various recits and arias, it feels of a piece. She uses the words dramatically. Very much one of the coming voices and this, her first and very bold recital. My pleasure Mr Osa, I can play this game all night and into tomorrow. I have the Ferrier disc, an unmistakable voice. The opening of the first Kindertotenlieder is like listening to a stained glass window. The voice sounds so immediate as though fresh and happening now, rather than almost 60 years ago. My pleasure Mr Osa, I can play this game all night and into tomorrow. The general tone of the recital is quite grave, Julius Drake is a real poet of an accompanist. He creates moonlit landscapes and matches Coote's range of volume. Isn't he just great! I'd never heard him until getting that Gerald Finley CD, and Drake's playing really made me sit up and take notice. Now for a favourite disc by a favourite singer. 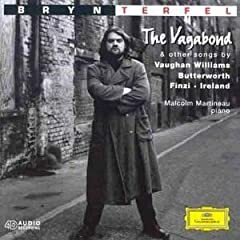 Bryn Terfel. Despite him being another frequent canceller of appearances, he is just so good that he gets all the work he wants. Here I feel is a phenomenal artist. He has his kitchy side and there have been rather a lot of crossover discs. But he is a chameleon. He can sing Broadway songs without making you wince. He can sing Wotan with jawdropping authority and drama. However of all his work, the disc that has given me the most pleasure is called The Vagabond. As the title may indicate, it means we have Vaughn Williams cycle of songs Songs of Travel. If he had never recorded any other works, this would have thrown him to the top of the pile as a singer who communicates. Song after song comes out as you may have heard it in you head, but had never heard it in life. The particular highlight is The Infinite shining heavens. VW wants some very tricky hairpins in volume Terfel delivers them all and the piece becomes liquid poetry. There is a collection of Finzi songs, Butterworth and Ireland. Here is authority and tenderness, imagination and word pointing, aided and abetted by Malcolm Martineau. A Shropshire Lad consists of six Butterworth songs. The final one is about a ghost questioning a living friend about what has been happening while he was dead. Ultimately a bitter song, the friend bedded the dead man's sweetheart and the living man gives an ambiguous deflecting reply to a question about her. Terfel fined his voice and empties it of tone for the ghost. It is a remarkable end to a remarkable disc. Now for a favourite song by a favourite singer. Bryn Terfel. Despite him being another frequent canceller of appearances, he is just so good that he gets all the work he wants. Here I feel is a phenomenal artist. He has his kitchy side and there have been rather a lot of crossover discs. But he is a chameleon. He can sing Broadway songs without making you wince. He can sing Wotan with jawdropping authority and drama. Oh I totally agree with you here, and I forgot I have this CD. Should revisit it, since he is splendid in all of this repertoire. Bruce, I heard that Handel performance on radio and Coote was indeed good. The main event though was David Daniels as Caesar and he sounded on top form; going from strength to strength as the opera progressed. The first time I heard him was a TV relay of Theodora, an oratorio produced as an opera by Glyndbourne. He and Hunt Lieberson together simply transfixed Jane and me. Sweetness allied with expressive ability. As soon as the video came out I got it and we played it to the point part of it stretched. Eventually it surfaced on DVD and we also snapped that up. I did so want it to appear on CD, but it did not. 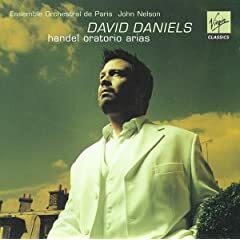 However, the arias for Daniels from the piece were included on a recital he issued in 2002. This is a disc of oratorio arias, but what does it matter, opera or oratorio, in sound only, I am just grateful for whatever turns up. Daniels is one of the new turbo charged Countertenors. He can sing softly, sweetly, but can also manage reasonable volume while coping with the colouratura aspects of the works. Here we get Belshazzar, Semele, Saul, Jeptha, Messiah and the core of the disc, four arias from Theodora. From that piece comes The Raptured Soul, eight taxing minutes, superbly sung, the melismas magical, the breath control allowing extraordinary long lines. The beautiful aria from Saul has unfortunately been shorn of the exquisite harp prelude, it is fine, but Scholl is just that bit better in that aria. Said to now be at his peak, though Lis does not agree, I just hope the stream of recitals does not dry up. There are two Handel discs, this is one, but the other is just as good. But he will have to watch....Jaroussky is younger and is chasing on his heels. Well, Mods have such good taste. I have that second disc, it is good, but not quite as fine as the first. Comparatively speaking he rushes the title song. It needs more time to allow that hot summer stillness to pervade. You must be right about the good taste because I consciously used the word "like" instead of "love" there. Interesting...I just haven't heard enough of him. Most countertenors, in fact, are a bit of a blind spot for me -- not sure why, other than the repertoire is usually off my radar. But almost everyone I spoke with who heard (or saw) this production said it was great. Bruce, I think countertenors are an acquired taste, but if you get the bug, it is rewarding.